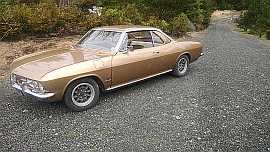 65 Corvair 500 A/C CP PG for sale Ariz. 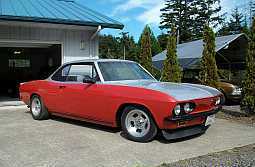 Helping a friend sell their family Corvair. Rust free AZ car. Been in the family for decades. Car was driven into garage with pushrod tube oil leak. Very straight with exception of bent driver rear corner below bumper. Very straight bumpers. A/C condenser was removed but have the parts. Good glass. Good interior. Have original steel wheels. 480-516-2574. Call or text and I can send some pictures. Edited 2 time(s). Last edit at 02/22/2018 09:59AM by MattNall. > Two door or Four door? It's interesting that a four door would sell faster on this forum than a two door. $1800 is a good price. Wish it was closer to the East coast. > > Two door or Four door? > faster on this forum than a two door. > $1800 is a good price. > Wish it was closer to the East coast. It appears that LM 4 doors are increasing in value & desirability as of late. Sorry guys I knew I would miss some details as it was late. It is a 2 door! I will do VIN check on it. The car is in north phoenix where it has been for last 40 years. play with it. I plan to soon for my own "enjoyment". Clean gas, oil, and a battery and I believe it will run. Air cleaners have been on the carbs for all the years of storage. The car would be mine but I have two other projects going not to mention the pergola and retaining wall I need to finish aarg. Great opportunity especially if you like comfort. cloth seats, a/c, auto. 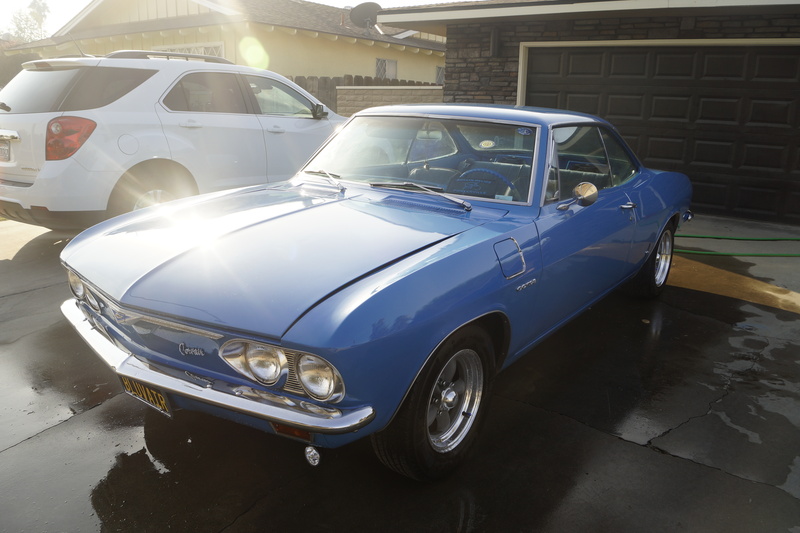 Re: 65 Corvair 500 A/C CP PG for sale Ariz.
Yep...missed that part in the title. I believe it is a 110. Dont know the diff. My guess is 355 or maybe more likely a 327. Good cruiser. looks like a 500 from the fender script holes in the front fender, post a picture of the build tag in the engine compartment? Thanks for updating the title for me. Oops the driver mirror is gone. It's probably there. If we could get a few more pics that might help this group know more about what it is instead of fielding a lot of questions/calls. A pic of the body tag (the plate inside the engine compartment on the left near the tail light) and one of the damaged rear under the bumper, that'd be great. 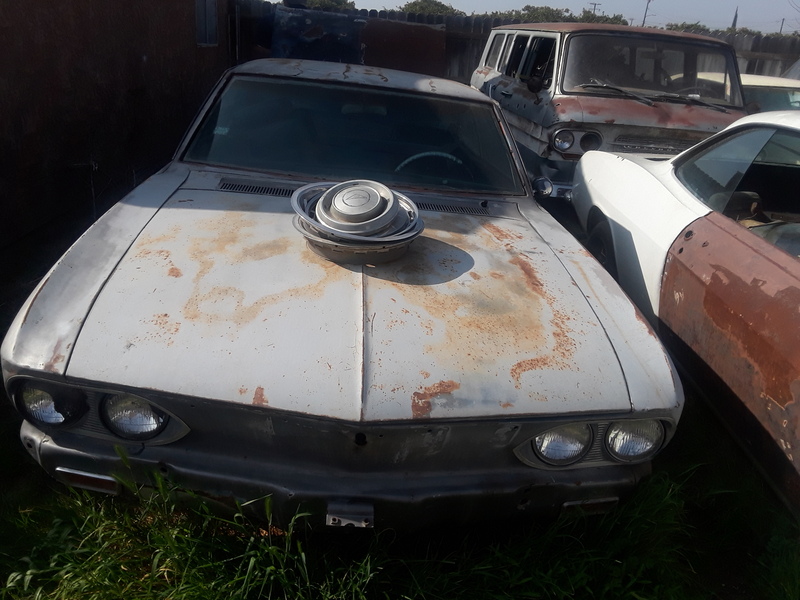 Others that might be helpful would be of the interior floor on the driver and passenger side, inside the front trunk area, at least one of the engine from the top. Since he mentioned the condenser had been removed I'll bet it is a 65. > Blask dash means 1966. 'cept it's a bare aluminum dash, not Black. Looking at the hoses still attached inside it appears the condenser was to the side. Those sound like Compressor hoses...more pics! one of engine will answer 100 questions..
Oh man, I guess the eyes are the second thing to go. > > Blask dash means 1966. > 'cept it's a bare aluminum dash, not Black.